It’s been a month since we last had a new episode of Supergirl on our screens, and for its grand return the show decided to throw everything at the wall and see what stuck. “Ace Reporter” is alternately a romantic comedy, a romantic tragedy, an action comedy, a heist, and at times even a chilling horror thriller. 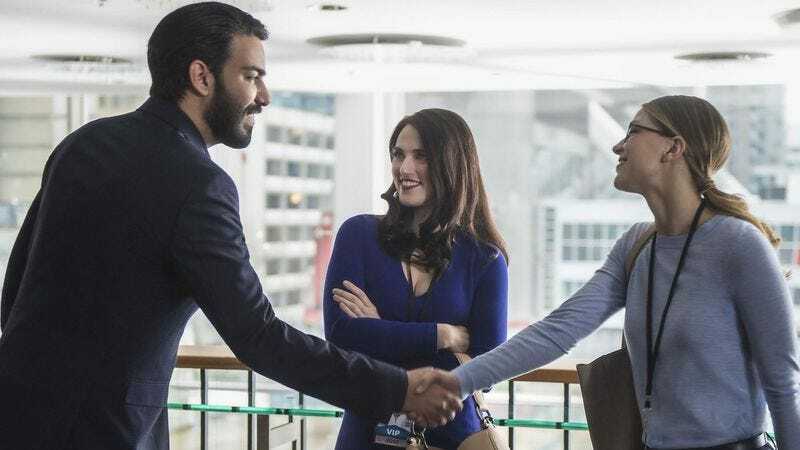 Supergirl is always a show that plays fast and loose with tone, but “Ace Reporter” gets especially extreme with its tonal shifts, horrifically killing off innocent people in one scene and engaging in fun heist shenanigans the next. That said, this show is generally better when its cramming in too many things rather than struggling to fill time. And if “Ace Reporter” is a little rushed and a little inconsistent, at least it’s never boring. Well, okay, the climax is a little boring if only because it centers on Supergirl being incapacitated while the guest player who was obviously introduced only to be the final baddie reveals she’s actually the final baddie. But everything up until then at least maintains a mile-a-minute pacing that keeps things engaging enough to forgive how underdeveloped they are. The best thing about “Ace Reporter” is that it finally puts the spotlight back on Kara as a mild-mannered reporter. One of my main complaints about Supergirl’s second season is how much the show has downplayed Kara’s double life as its raison d’être. 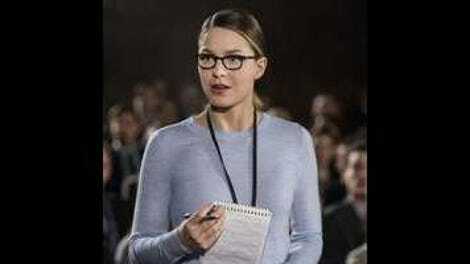 It’s not so much that I’m particularly invested in Kara’s journalism—indeed, the show’s understanding of journalism has always been far too nebulous to provide fodder for compelling stories about the field itself—but her CatCo career is a lens through which Supergirl can examine the Kara Danvers half of Kara Zor-El’s double identity. And that’s something Supergirl has lost track of too many times in its increasingly DEO-focused second season. The first half of “Ace Reporter” is a delightful excuse for Melissa Benoist to play up all of Kara’s bumbling adorableness as she joins Lena Luthor at a tech launch event for Spheerical Industries in which CEO Jack Spheer (iZombie’s Rahul Kohli) introduces the world to his new all-powerful nanorobot technology. And though she’s sworn it off for good, Kara quickly finds herself sucked back into the world of investigative journalism when an informant comes forward with information that the Spheer’s medical miracle Biomax might not actually be what it seems. Like so much of Supergirl, the plot doesn’t really hold up under scrutiny (would this informant really choose a relatively unknown journalist with one blog post to her name as his most trusted source?). But in the broadest strokes, it works as a way to draw Kara the reporter (rather than just Supergirl the hero) into the central story. And it’s no mystery where the episode could’ve made some cuts. By far the weakest part of “Ace Reporter” is the James/Winn/Lyra subplot, which kind of boils down to “women be crazy, amiright?” as Lyra gets far too brutal on her first night of vigilantism with the boys. James admitting Winn is his best friend at least gives Mehcad Brooks a chance to remind us all that he’s a likable, talented actor when he’s actually given material to work with. But Winn and James’ Super Friend shenanigans make for a truly bizarre and tonally jarring B-plot stuck into an episode already pressed for time. That subplot aside, “Ace Reporter” manages the curious trick of working fairly well on both a macro and micro level while mostly botching the middle ground of actual episodic storytelling. In other words, softening Lena with a love interest and then challenging her with his death is an interesting way to continue the thematic exploration of Lena’s relationship to her family’s villainy. And on a scene-to-scene basis, Katie McGrath and Rahul Kohli are utterly charming together as the writing finds sweet moments of connection between them, like Jack’s story about migrating birds making him wish he had followed Lena to National City. But when it comes to actually telling a satisfying episodic story about the two of them, Supergirl drops the ball by cramming too much story into too little time. Similarly, the idea of Kara organically realizing that journalism is her calling is a spot-on way to bring her back to CatCo. And little moments in her dynamic with Snapper hint at the charming rapport the two could have if the show committed to making their relationship a central one. But both Snapper as a character and journalism as a concept are far too underdeveloped for the show to present a fully satisfying episodic story about Kara’s return to work. How much that odd storytelling imbalance ruins the episode will likely come down to each individual viewer. For me, at least, “Ace Reporter” offers just enough to make me glad to have Supergirl back on screen even though the show’s imperfections are as glaring as ever. And it helps that the Kara/Lena dynamic continues to be one of the loveliest ones on the series. Supergirl has explored female relationships via sisterhood, mentorship, romance, and antagonism, but the Kara/Lena relationship is its first real exploration of simple female friendship. Even when Kara rather awkwardly crashes Lena’s date with Jack, Lena isn’t catty or snippy. She assumes Kara is trying to help, even if she can’t fully understand her friend’s methods. And when it comes time to try to process Jack’s death, Kara offers the simple support of someone who knows what it’s like to lose so many of the people you hold dear. That sort of female-centric storytelling continues to be a relative rarity in the superhero genre. And for all of Supergirl’s jarring tonal shifts and rushed storytelling, its female relationships are at least one thing the show almost always gets right. Katie McGrath’s American accent has never been the best and it really starts to slip when she’s paired up with Brit Rahul Kohli. Since I criticized the show for overusing him as a main player in my previous review, I’ll compliment “Ace Reporter” for making excellent use of Mon-El as a funny, charming supporting player. His Spheerical Industries break-in with Kara was a delightful little tangent. Kara emerging from the burning car was a chilling bit of Supergirl imagery that called to mind a similar Superman scene in Batman V Superman. But an even more subtle use of her abilities came when Kara took a piping-hot cake pan out of the oven with her bare hands. Although the final battle was a little lackluster action-wise, the earlier shot of Kara freezing the nanorobot swarm was really, really cool looking. The episode ends with Rhea offering Lena an offer she potentially can’t refuse. Next week: Alex is in danger and Supergirl is the only one who can save her.